More boats! K and I went shopping on Saturday and since the weather was nice we walked out to the marina afterwards to snap these photos and enjoy the falling leaves. Some trees are already leafless in the city but in my hometown there isn’t a yellow or red leave to be spotted yet. So I’ve been scrolling through way to many Flickrs and Pins from the fall in New England, United States because their fall foliage is crazy. And I just love the white fences next to all the tiny roads. Some might be wondering how my driving is going and I have to say it’s like swimming or bike riding. Once you learned it, apparently, you can’t un-learn it. I didn’t drive for about a year, but I picked it up again in minutes and now my lessons are going good. Even though I am still miles away from an actual drivers license I treated myself with a little impulsive shopping spree at Zara. Girls just wanna have fun. I’ll leave you with an Instagram picture from the scenery! Love your boots! Did you get them this season? you look so pretty,love the color of your dress! wat een mooie locatie!! Leuke outfit! Great color. The mustard compliments your hair. =) Fall is your season. I live near New England but fall foliage hasn't hit its peak yet. I can't wait until it does! Aw your adorable. I love this outfit!!! I wish I could wear this color, but us blondes just can not! Yes New England is beautiful right now!! I am fortunate and while I have a "big commute" (roughly 45 minutes) I drive down a highway that is recommended for leaf peepers! Its beautiful!! i love the yellow with the burnt orange scarf! pretty! i love this outfit, such a cute dress! I wish I had a marina to stroll through on a nice day! Your outfit has great colors and I'm glad to hear your driving lessons are going well. Oh, glad driving is going well! Love how pretty yellow is on you. its such a bold color yet really lovely. love your boots, and that gold is a great color! Gorgeous instagram photo. I love that. And you look so cozy! I really love the color of your scarf with that yellow dress! Love your accessories! I can't wait to pull out the scarves for fall–summer is still lingering around here in so. california. Loving the mustard yellow with that amber orange scarf! Mustard, oatmeal, rust…three colours that pair so perfectly together!!! 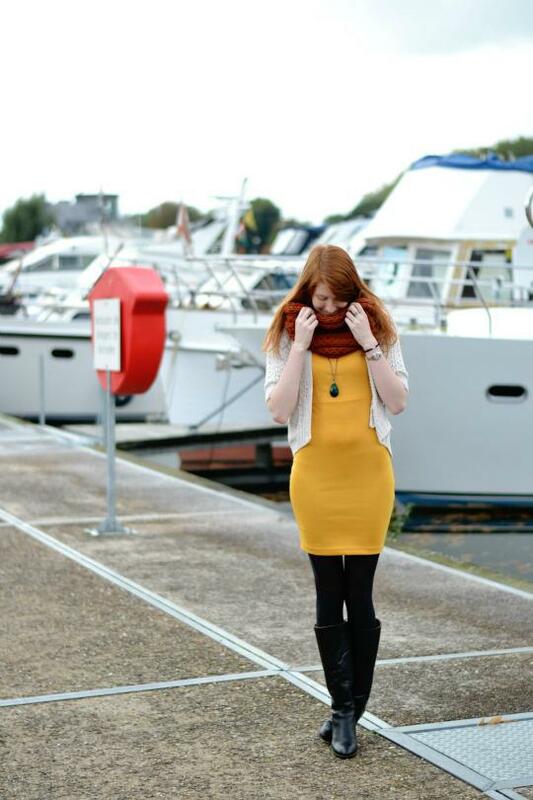 Just love the autumn vibe you've perfected here! 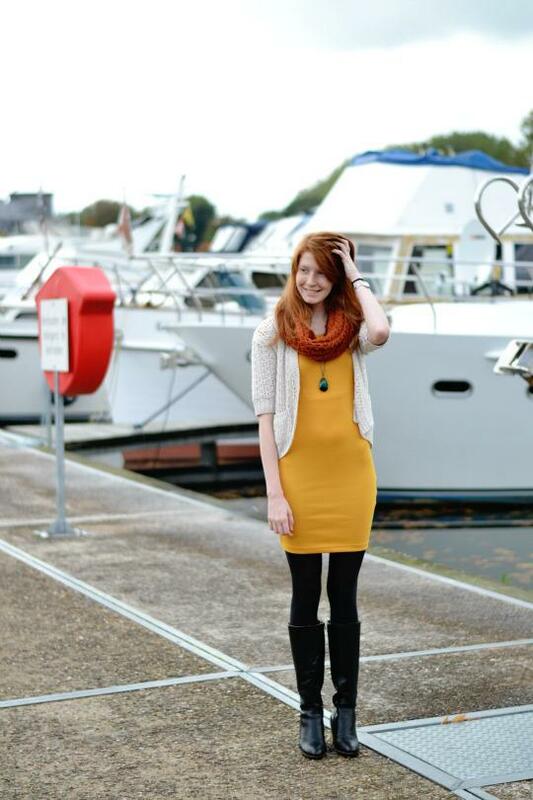 This is SUCH a perfect fall outfit – love that mustard dress! cute look, we love your dress! Love the name of your blog and this post is stunning. 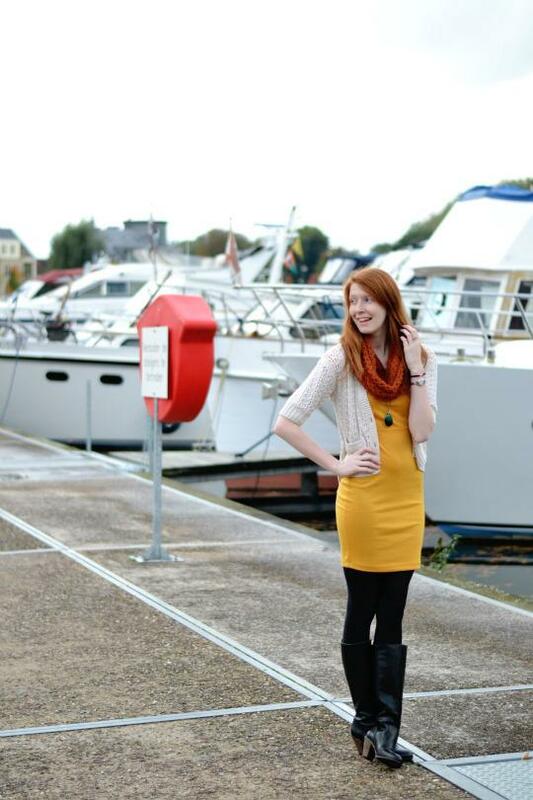 Hele leuke locatie en mooie outfit! Prachtige foto's! I'm glad your driving lessons are going well! You're so lucky you have these marinas so close to you, ridiculously pretty!